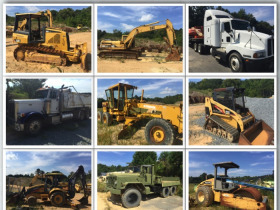 Huge Contractors Jobsite Liquidation of Heavy Construction Equipment, Dumptrucks, Tools, Trailers and a tremendous quantity of building supplies (thousands of lbs of rebar, thousands of feet of metal sheets for concrete, new parking lot lighting, concrete wire mesh, etc). The jobsite has been shut down by the out of state contractor and he has ordered all of the equipment and building materials sold Absolute to the highest bidder. This auction is a coordinated effort by MarkNet Alliance Auction Partnering Firms - Pearce & Associates, Alabaster, Alabama and LW Benton Auction & Realty, Macon, Georgia. Online Bidding ends Monday, November 7th @ 7:00pm Eastern time. A complete bidding catalog is being prepared and will be posted soon. Complete portable concrete plant, purchased new from China at over $200,000 and never assembled or used. A tremendous amount of rebar. Some has been cut for the project but most has never been cut. 20’ lengths, supposed to be over 320 tons! 45’ Equipment Trailer by AMS. Huge Detachable lowboy trailer with multiple components and its own power source. Payment: Cash, Approved Check, 15% Buyers Premium. For wire transfer instructions, please call 478-744-0027. All wire transfer fees will be the responsibility of the buyer. Local Georgia Sales Tax will apply to each item. Dealers buying for resale may be exempt from paying sales tax if the dealer has a sales tax number and a signed tax exemption form at the time of payment. All payments must be made to L.W. Benton Company, Inc. Purchased items must be paid for in full within 48 hours of the close of the auction, unless other specific payment arrangements have been agreed to and approved by L.W. Benton Company. After that time, L.W. Benton Company, Inc. reserves the right to charge the full purchase price, as well as any fees, to the credit card on file from the Bidder’s auction registration. Vehicle Title Cancelation: Buyers who purchase titled vehicles with the intent to scrap, salvage and/or dismantle said vehicles may be exempted from the $100 document fee by signing a letter stating their intent to do so, thus granting L.W. Benton Co. permission to request that the State cancel the current title. Upon doing so, Buyers understand that there is no remedy to this request and a title cannot be reapplied for once submitted to the state for cancelation. A title cancellation fee may apply. Auction Bid Default: If the winning bidder's credit card information is on file with L.W. Benton Company, Inc., that card can be charged for the total purchase price plus one $25 late payment fee if payment is not otherwise made or arranged within 48 hours of the close of the auction. If no credit card information is on file or if the information is insufficient or outdated, a $25 late payment fee will be assessed for each partial or full day beyond the payment deadline for which payment is not made. If items are not timely removed as required above, a $10.00 handling and storage fee will be assessed per auction lot, per day. If an item is not removed within twelve (12) days after the auction, the item can be considered abandoned property, with all of the buyer's rights and interests in the property extinguished with no refunds owed or offered to the buyer. The seller reserves the right to sell these items to backup bidders and hold the original bidder liable for resulting losses to the seller. L.W. Benton Company, Inc. and/or the seller reserve the right to pursue all legal remedies.